Billy Jones and Jon Taylor are expected to be fit as Rotherham look to build on their first away point when they visit Preston. 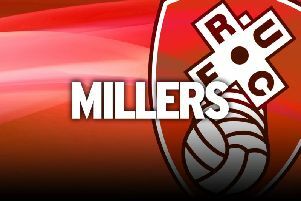 Jones (hamstring) and Taylor (knee) missed Tuesday's 0-0 draw at Middlesbrough with injuries as the Millers finally ended their six-game losing streak on the road this campaign. Both men returned to training on Thursday and barring any reaction should be involved at Deepdale. “They have both trained, the lads who played Tuesday haven't been on the grass,” Warne said. “The others all trained and we put a bit of distance into them and beat them up a little bit which was nice. Warne admits to having a quandary in terms of selection as he is reluctant to rejig a team that arguably put in their best performance of the season to nullify the league leaders on Tuesday. The boss admits that if there are to be any changes in Lancashire, they are likely to be higher up the pitch. “It is a difficult one, every manager has the same quandary, if the team does well but you want to freshen it up it is hard to take anyone out,” he conceded. Young defender Emmanuel Onariase has joined National League Dagenham on loan until January. The 22-year-old joined the Millers last year as one for the future but has only managed to feature in Checkatrade Trophy games and Warne is happy for him to get games. “I think the world of Manny, unfortunately for his development we got promoted and I think it is just a step too far for him,” he said. “We had four centre-halves ahead of him and he was always going to struggle to get game time. “A great kid, probably the best all-round human-being we have if am being honest. He wants to go and play football. “After the window shut we weren't able to get him anywhere in the league so the only option he has got now is to go into the Conference.